Isolated in the Rif Mountains, Chefchaouen is one of Morocco’s hidden treasures. Chefchaouen is situated in the Rif Mountains, just inland from Tangier and Tetouan making it the perfect Rif Mountain holiday adventure. The city was founded in 1471, as a small fortress which still exists to this day, by Moorish exiles from Spain ed by Moulay Ali Ben Moussa Ben Radhed El Alami to fight the Portuguese invasions of northern Morocco. Chefchaouen was known as one of the main concentrations of Moriscos and Jews who sought refuge in this mountainous city after the Spanish Reconquista in medieval times. This small mountain village sweeps you away into a state of calm with its color scheme that embraces every imaginable shade of blue and is the perfect place to spend a holiday in the Rif Mountains. 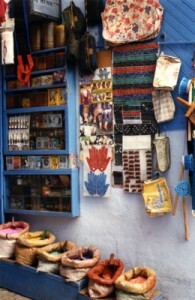 Bold splashes of cobalt, turquoise, teal, white and starlit blue surround each corner and cobbled alley. 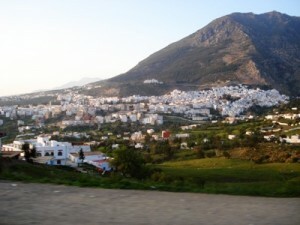 Dreamlike and peaceful during the day this blue and white washed city has breathtaking sunsets and offers up a variety of charming Riads, outdoor restaurants with views of the Rif Mountains and is the perfect two or three day excursion from Tangier or Fes. Chefchaouen offers plenty of time to explore its laid-back Medina (old city), drink mint tea or freshly squeezed orange juice, and watch the world go by from one of the cafes in the main square. 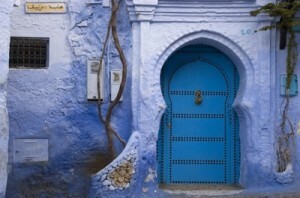 Chefchaouen is also a great place for long walks, treks and hikes. Trekking in the Rif Mountains is different then trekking in the High Atlas Mountains of Toukbal for example because the altitudes are lower in the Rif and the mountain ranges tend to be longer and wider with less steep, making it accessible for Moroccan travelers of all ages. Must-see destinations include the Central Mosque and the wonderful Kasbah in Chefchaouen, built by the legendary ruler Moulay Ismail near Place Outa el Hammam in the early 18th century. The Kasbah encloses a quiet garden and houses a small museum of ancient pottery and photographs of the traditional dress of Berber tribes. Although this lovely haven of Chefchaouen is located just a couple hundred kilometers from the European border, until 1920 Chefchaouen received only three European guests. It was founded in the 15th century and populated by Jewish and Muslim refugees from the Inquisition in Spain and remained an isolated city until the early 20th century. 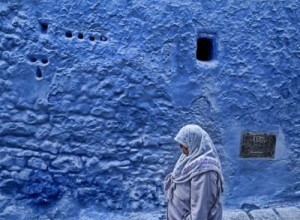 Chefchaouen has preserved a way of life that flourished in Moorish Spain more than 500 years ago. While the locals are far more reserved then those in larger cities, they are quite friendly and warm. Chefchaouen is one of the main producers of cannabis in Morocco, and the weed is sold all over town. It is essentially legal and smoked by many of the locals, which helps account for this village’s slow pace. It is an intrinsic part of the city life and sold together with herbs, spices and vegetables in the local markets. During a four-day trip from Fes Moroccan travelers explore the Medina in great detail. 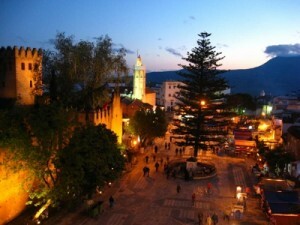 The entire Medina comes alive in the evening when everybody is shopping or selling goods in the narrow winding streets. On a leisurely stroll throughout the Medina the first thing that can catch anyone’s eyes are the man selling pigment in shades of blue, yellow, pink and orange. The pigment is the same that is used on the walls of the city. There are shoe cobblers hand making the white and yellow fine leather pointed slippers (baboosh) worn by the locals along with many beautiful jalabbas sewn with finely embroidered seams and carpenters carving tables and chairs made of fragrant cedar wood. Also available are beautifully hand painted crafts in Chefchaouen such as mirrors with inlaid flowers and a wide variety of furniture displaying delicate Islamic designs. One of the most intimate things to do in Chefchaouen is to drop in on a local Berber weaver at his loom and watch while he produces a local style of red and white blankets. 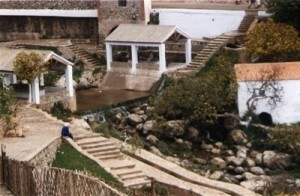 If Moroccan travelers continue their exploration to the bottom of the hill in Chefchaouen, they will find women washing laundry in an area that resembles a Japanese garden filled with a variety of stones as well as miniature white open structures surrounded by a number of wide stairs that leads to a dam. For a panoramic view, you can hike to the top of Chefchaouen and, as you glide along the small streets, peer downward in search of the stone-carved Hand of Fatima that seems to reappear again and again throughout this blue city. 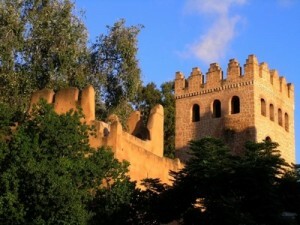 You are currently browsing the archives for the Chefchaouen Tour category.